5 for 5 for #5 and Arenado keeps the streak alive. Another bad batting practice today. Did have a few by me and one knocked out of my glove by a bare hand idiot. This is just something that drives me crazy because you rarely see them actually catch the ball and usually it deflects off there hand and hits someone else. This guy did end up with the ball because after he smacked at it bounce a row behind me and 2 behind him, I duck once it got deflected and he dove over the seats. It was not a bad day for autographs a bunch of guys signed and I got a Brandon Barnes card signed. 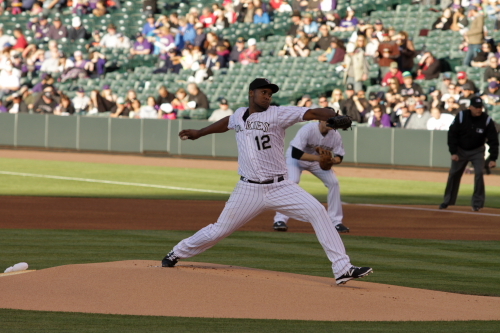 Juan Nicasio was the starting pitcher for the Rockies. he got the first 2 rangers batters out and then gave up a 1 run home run to Andre Beltre to give the Rangers a 1 run lead. 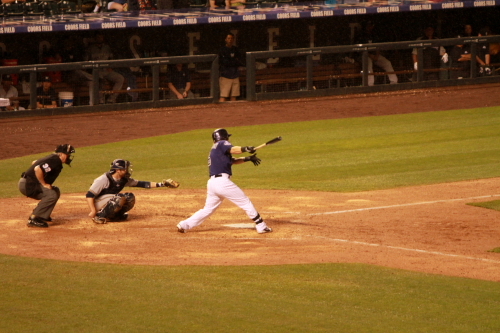 The first out of the game was a ground out by Chin Soo Choo to Charlie Culberson who made the start at second. Prince Fielder struck out to end the inning. Robbie Ross Jr. Started for the Rangers. 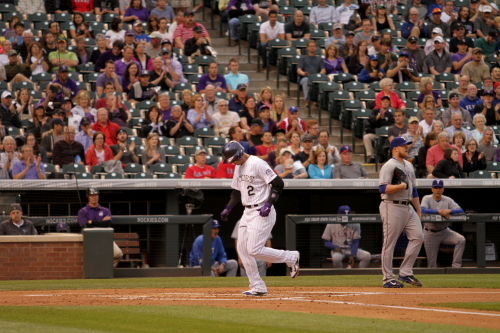 Charlie Blackmon hit a lead off home run for the Rockies to tie the game in the first. 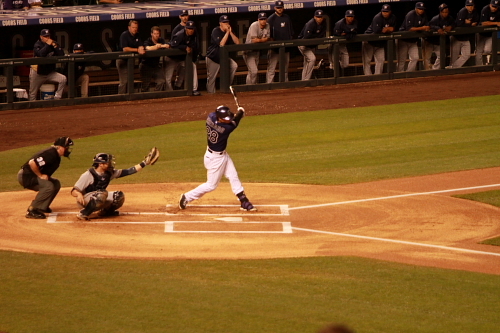 Tulowitzki would get hit by this pitch to get on base. Carlos Gonzalez would hit a single top get Tulo to third. Nolan Arenado was looking to extend his hitting streak to 16 games. 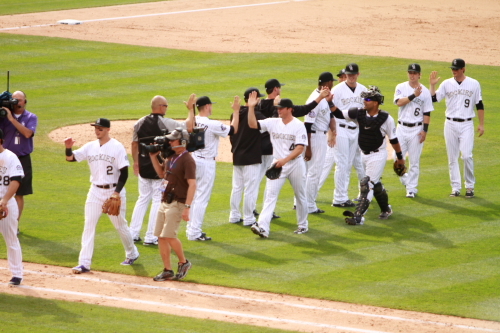 This streak dates back to the White Sox series during the first home stand of the year. 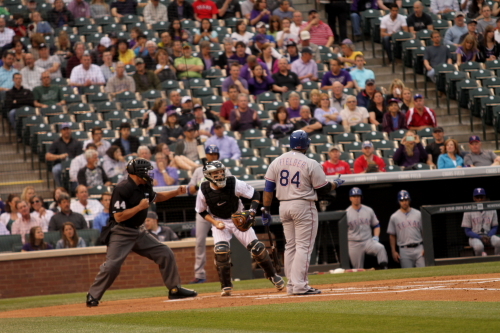 This at bat he flew out to right field and Tulo scored from 3rd. to give the Rockies a 2-1 lead. 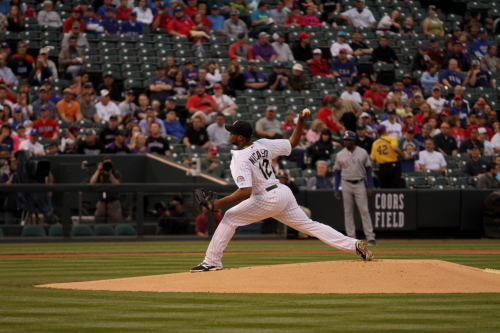 Juan Nicasio kept the Rockies in the game and pitched well. He did pitch till the 5th inning and had thrown 88 pitches in 5 complete innings. Which is over 17 pitches per inning. He control was the issue he only gave up 2 hits. He did walk 5 batters and only struck out 1 batter. The Rangers did only get 1 run on the Beltre homer in the 1st. The Rockies did get a single run in both the 3rd and 5th inning. 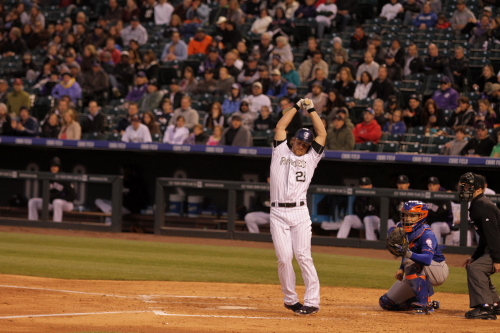 Drew Stubs lead off the 3rd with a single and scored on a Cargo single. It was his second hit of the game. The 5th inning run was also started with a Stubbs hit this time a double and scored single by Cargo to give the Rockies a 4-1 lead. 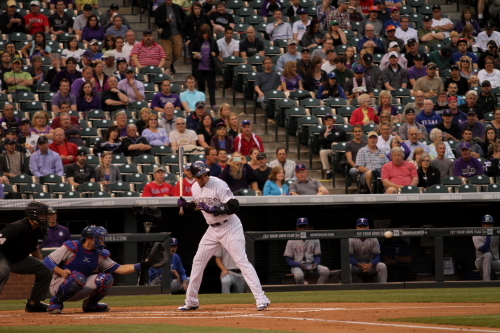 This was Cargo’s 3rd hit of the game. The Rockies bats really came alive in the 6th not that they were not hitting the first 5 innings, but in the 6th 7 of the 9 Rockies in the line up had a hit and most also had an RBI or scored. 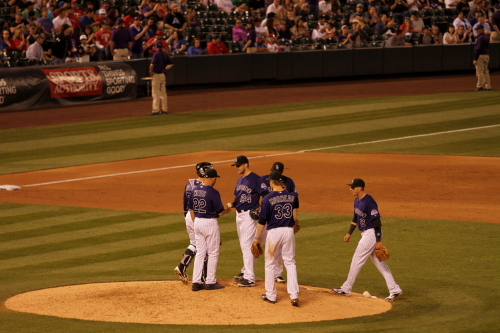 Brandon Barnes was the first base runner of the inning. He hit a single and advanced to second on a error at first base. Charlie Blackmon hit a double scoring him for the Rockies first run of the inning. Drew Stubbs got the second out of the inning a ground out to third then the hits really started coming Tulo hit a double followed by a single by Cargo. 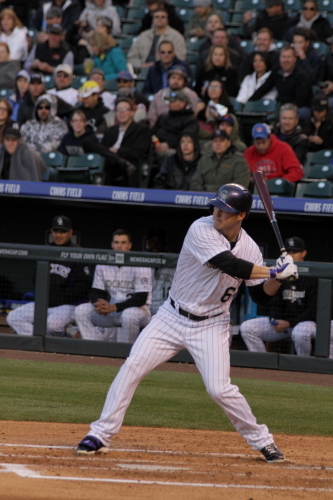 Nolan Arenado was walked, Justin Morneau, Charlie Culberson, Jordan Pacheco hit a single his second at bat and the runs kept coming with the men on base. Barnes hit a single his second trip to the plate. In total they had 8 hits and scored 6 runs. The Rockies had a 10-1 lead. Drew Stubbs decided that 9 run lead wasn’t enough in the 7th and hit a lead off home run. 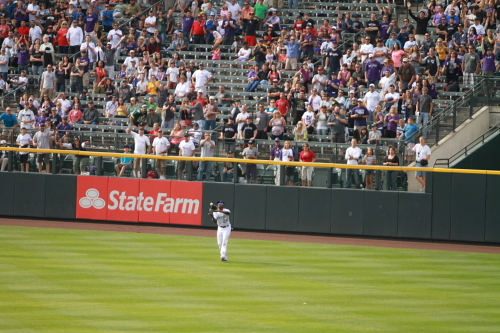 Cargo hit his 5th hit of the game a ground rule double of the fence in left center. 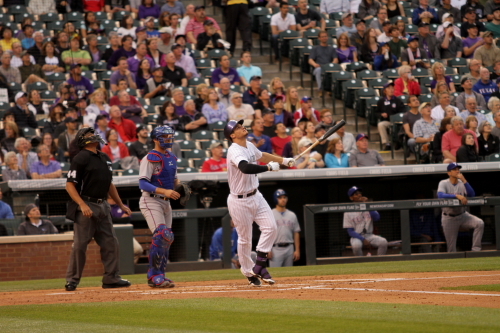 Followed by a Arenado double to score the 1212 Rockies run of the game and extend his hitting streak to 26 games. 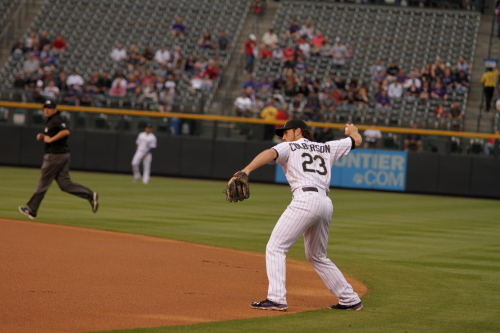 Arenado rounding first heading to second as Choo gets the ball in the left field corner. 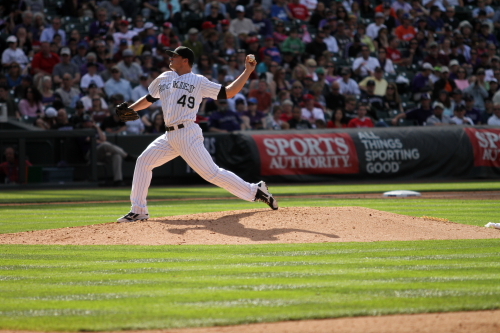 Matt Belisle came in and pitched the Rockies, he gave up 2 hits and walked Elvis Andrus to load the bases. Both hits and walk came with 2 outs, He got out of the inning when Josh Wilson grounded out. In an interesting twist the Rangers used Mitch Moreland to pitch he is and infielder and has been the DH this year for them. he was probly the best pitcher for the rangers all game he had the first 1,2,3 inning of the game in the 8th inning. 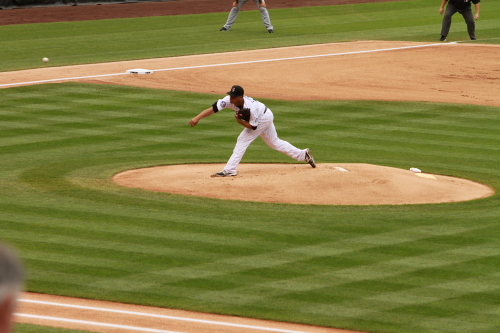 This is a look of the second pitch he threw to Jordan Pacheco. Andre Beltre sends one deep to center with 2 outs in the 9th inning. That ball was caught be Drew Stubbs to end the game and the Rockies won the game 12-1 and the home stand with a 5-1 record. What a great home stand for them these bats are just on fire and pitching is keeping them in the game. I think Blake Doyle may be a big factor in the batting, because he is a teacher and was not a player who hit well. After 4 batting coaches over the last few years I think he has really helped in getting the team as a whole batting so well. It is exciting to watch this team play again and you never know who will be the guy who gets the hit in the clutch or get things going not just relying on the middle of the order. From Charlie Blackmon leading off with big hits to the bottom 3rd of the order getting things done as well. Marc Stout interviewing Cargo after the game. 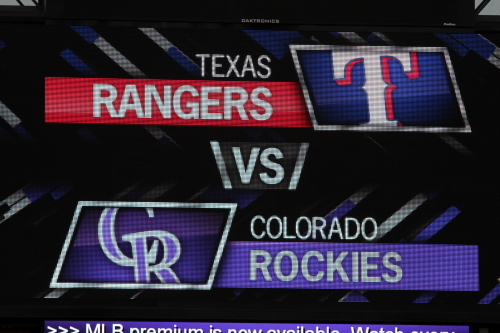 That is it for this one the Rockies are playing the next 2 in Texas before heading to Cincinnati for 3 this weekend and then to Kansas City for 2 that I will be at. So see you at Kaufman!!!!! Two for Tulo and Lyle see’s the 9th! My 16th game at Coors this year. Before the game I headed in and went to the Pavilions for batting practice within a few minutes. Tommy Kahnle picked up a ball from the warning track and said high and he tossed it up to me. This was only my 4th ball of the year. It was pretty cool because I usually do not get to many toss ups. Then I head over to the first base wall to see if I could get some autographs and Brandon Barnes was one of the first to sign and I had just got a photo of him printed of his triple on opening day. Charlie Blackmon and Mike McHenry signed. So while I was standing there Marc Stout from root sports came up to me and asked about the 2 photos of photos I took of Charlie Culberson on Saturday night. He said that Charlie really like him and I said I had extra copies of them on me and he said he would send him over. Charlie then came over and I gave him a the photo of his swing and the black and white of him running to second from first. He also signed a copy of each for me. I thought that was cool that he saw the photo’s on twitter and I was able to get copies of them to him. Jordan Lyle started the game for the Rockies he had an incredible outing He got the first 6 batters out, that he faced and the Rangers did not get a hit off him till the 3rd inning, it was a double by Elvis Andrus. 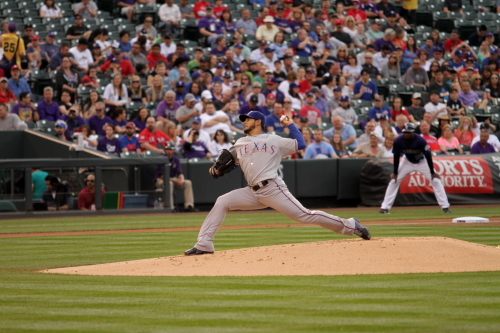 Martin Perez started for the Ranger he has been pitching very well this year and then he came to Coors!! After a pretty efficient 1st inning, where he struck out Brandon Barnes and got drew Stubbs and Troy Tulowitzki to ground out. The second inning things changes as Carlos Gonzalez started the inning with a a double and Nolan Arenado he a 2 run home run to left field to give the Rockies a 2-0 lead. Before this game Perez went 46 inning without having a homer hit against him and went 26 inning without giving up a run. With the challenge that brought up Jordan Lyle who has been hitting well, but did strike out in the at bat. Someone said it was weird to do that to get to the pitchers spot. I thought it was a good idea, because Lyles can hit and if he got out which he did it flips the line up so Brandon Barnes would hit lead off in the 3rd. inning. 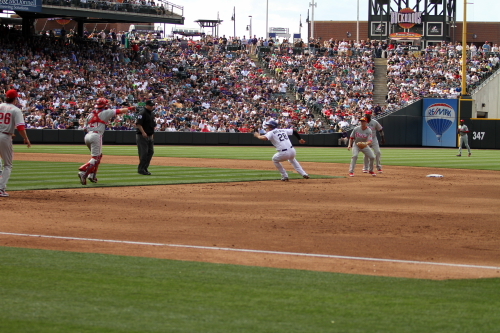 Barnes did lead off the 3rd and it benefitted the Rockies when he hit a lead off double and would score the Rockies 3rd run of the game, on a Cargo sac out. The Rockies scored 2 additional runs in the 5th and 7th inning both the same way Drew Stubbs got the first hit of each inning a double and both were followed by a Troy Tulowitzki home run. 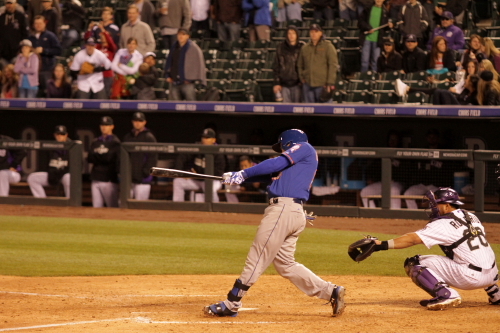 Tulo has been hitting like crazy lately batting almost .600 at home and over .400 for the year. Once again it is great to see him hitting and playing the way we knew and expected him to hit over the past few years. He must be seeing beach balls being thrown by the pitcher. He also just won the April MLB player of the month and is making a case to get it in May as well. The Rangers did score a run in the 6th inning. 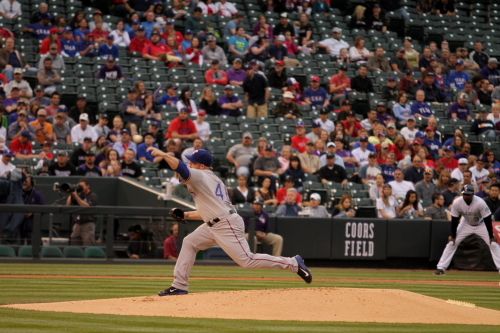 Shin-Soo Choo started the inning with a double and advanced on a Drew Stubbs error in center. 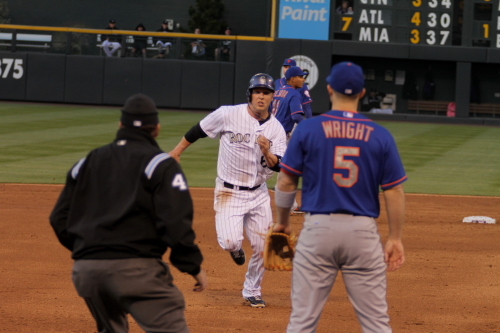 Choo then scored on a Josh Wilson ground out to Tulo at short stop. The Rockies had a 7-1 lead. 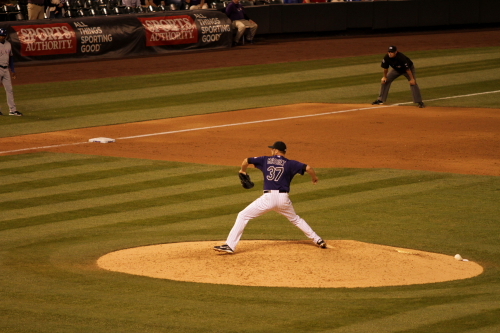 This is what a Rockies pitcher looks like pitching in the 9th inning, he almost went the distance. He also batted, hit a single and scored the Rockies 8th run in the 8th inning. Like I said earlier he had an incredible game and kept the Rockies in this game. He was removed in the 9th after Beltre hit a lead off single in the 9th. He gave up 7 hits and 2 runs the second was Beltre in the 9th. He struck out 5 and only walked 1 in his full 8 innings he pitched He pitched 104 pitches 71 for strikes. 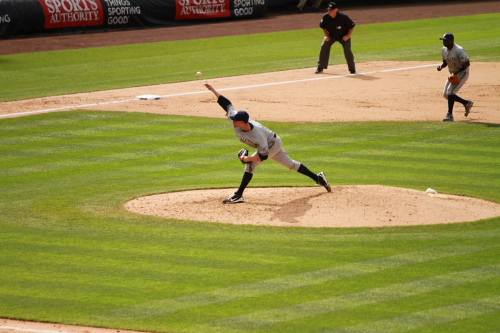 Nick Masset pitched the remainder of the game. Masset was just called up from Colorado Springs, the first batter he faced was Prince Fielder who he walked then Alex Rios hit into a double play. He then gave up 2 single and the second Rangers run scored. The run really did not matter when you are up by 6. I would have left Lyles in till he was in a little more trouble then just giving up a single. But the Rockies got out of the inning and took he game 8-2. It was another great start for Lyles who has been pitching great since his call up in early April for an injured Tyler Chatwood and kept himself in the starting spot and is now 4-0 with a 2.62 ERA. The Rockies are now 20-14 and 2 games back of the first place Giants. So that is it for this one and the Rockies have another game at home before heading to Texas for 2 and then continue on a road trip to Cincinnati and Kansas City. I will be in Kansas City for that 2 game series first mini road trip of the year!!! See you at Coors and Kaufman! I also have to Thank E to the MNF’n B Yo for getting 5 guys on my 2014 team project since I was not able to make Sundays game he brought my 16×20 to the game and got me Ryan Wheeler, Chris Martin, Eric Young and Mike McHenry. Then this game got Blake Doyle while I was waiting for Charlie Culberson thanks E to the MNF’n B Yo!!!! Nicasio has a big night at the plate and the Mound! My 13th game at Coors this year. 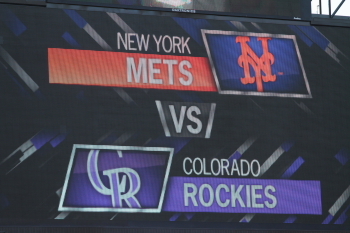 Did not do to well at batting practice today the Rockies did not take BP and the Mets was O.K. but I was never in the right place at the right time always seemed I was a section off all day!. During BP Geoff told me he may have an extra ticket behind the Mets dugout, which was very cool of him. Many of you may remember that I was originally from N.Y. and grew up a Mets fan so that was awesome. 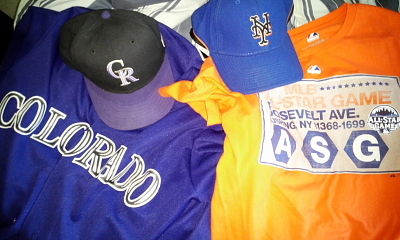 The morning before the game I had to make the decision do I want to wear my normal Rockies stuff or my Mets stuff it was a tough decision but I went with my usual Rockies stuff, usually I will wear a Mets hat with my Rockies Jersey. I wish I had grabbed my Mets stuff just because of the seats! 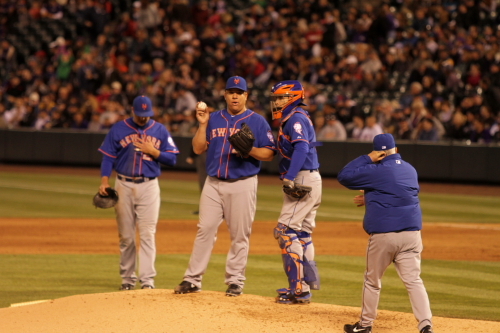 He was wearing his and got Bartolo Colons warm up ball and a gamer from Ruben Tejada hit by Justin Morneau in the 3rd. Juan Nicasio was the starting pitcher for the Rockies the first batter he faced was Juan Lagares the Mets center fielder started the game with a double and it looked like Nicasio was in trouble early, But after Daniel Murphy lined out to Nolan Arenado at third David Wright lined out to Troy Tulowitzki at short and Lagares was caught off the bag at second for a double play. Nicasio got out of the inning with 11 pitches. 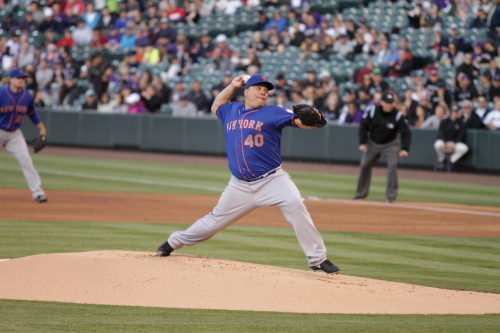 Bartolo Colon was the starting pitcher for the Mets. He got Charlie Blackmon to fly out to left and then struck out Arenado. He did not have great stuff to the first 2 batters but got them out then Carlos Gonzalez came up and took a 90 MPH to right center for a solo home run and a Rockies 1-0 lead. 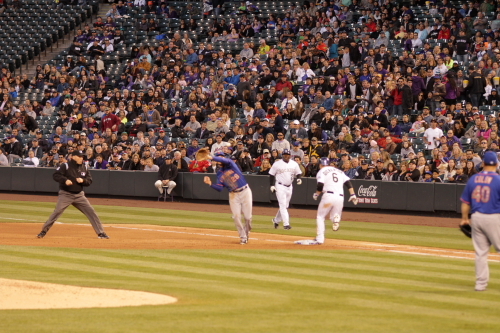 Tulo would end the inning flying out to left. 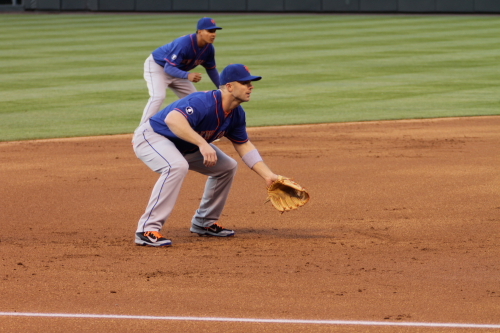 Hey look David Wright at third base. Lucas Duda started the inning with a out and Chris Young hit a single. 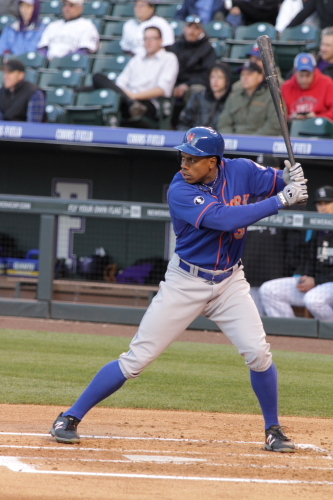 Here is Curtis Granderson batting in the 2nd inning after Youngs single. Juan Nicasio pitching with Chris Young on base. 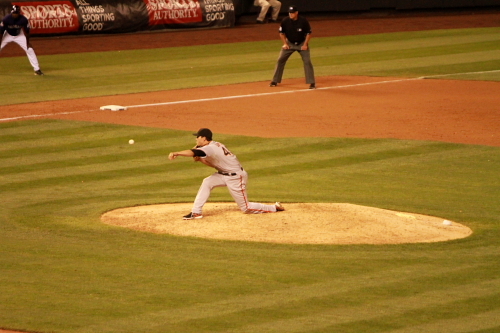 Young did steal second but did not score and Nicasio got out of the inning. 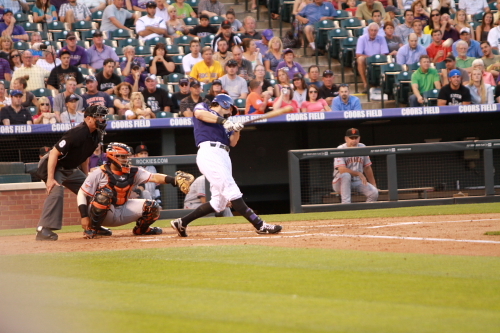 Corey Dickerson taking a swing right before his 2 out single. Charlie Culberson would also hit a single and Nicasio would hit a single. 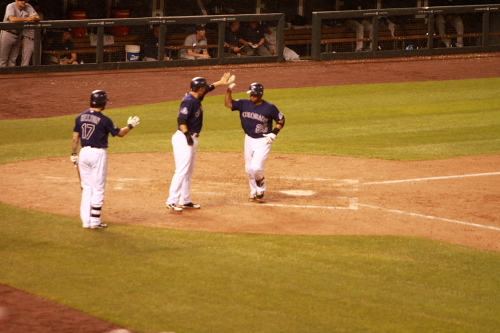 Dickerson and Culberson both scored on the single. It was a very good hit down the right field line that may have been a double for a position player instead of a very long single. 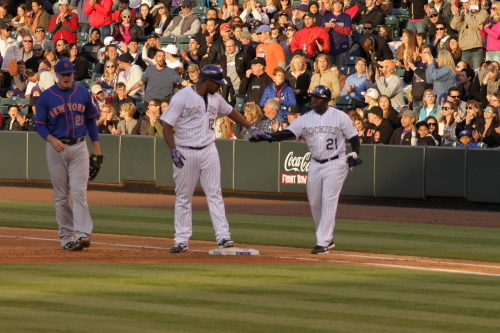 above he is giving Eric Young five after the 2 RBI single to give the Rox a 3-0 lead. 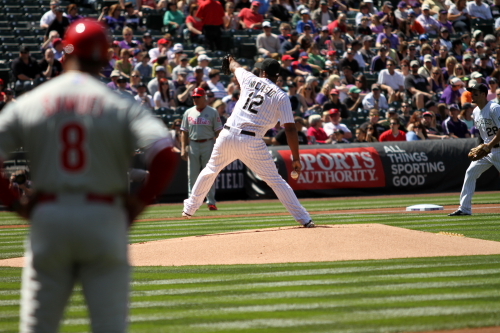 Nicasio pitched another very good inning in the 3rd and the Rockies did not score in the 3rd either. After a Wilin Rosario walk in the 4th Corey Dickerson threw down a bunt. Which first basemen Lucas Duda fielded. Which was thrown past second baseman Daniel Murphy into right field. Culberson was then hit by a pitch.to load the bases. 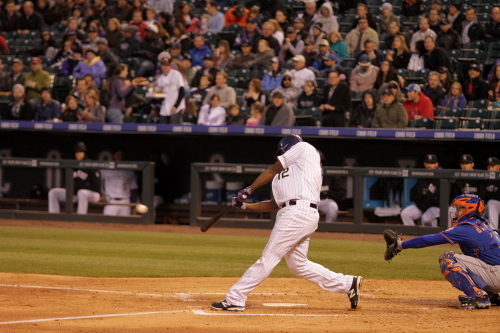 Juan Nicasio would get his third RBI of the night on a sac-fly to center. 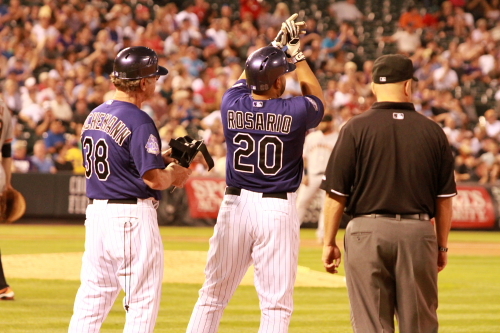 Scoring Rosario from third! The Rockies extended their lead 4-0. Charlie Blackmon would hit a single to score Dickerson and Culberson for a 6-0 Rockies lead. Culberson stepping on the plate for the 3rd run of the inning. It looks like he may have been out but I am not saying anything!!!! Nicasio kept the Mets batters to a minimum in the 5th and the Rockies picked up another run Justin Morneau got on base with a single. He would score on a Dickerson triple. 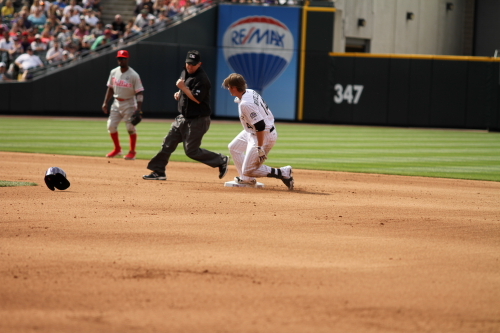 he is being waved around by Stu Coles at third for the 7th run for the Rockies. Bartolo Colon was taken out of the game after the triple and was replaced by Jeurys Familia. Colon gave up 10 hits 7 runs, he did strike out 3 and walked 1 in his 4.2 innings on the mound and can’t forget the hit batter Culberson in the 4th. 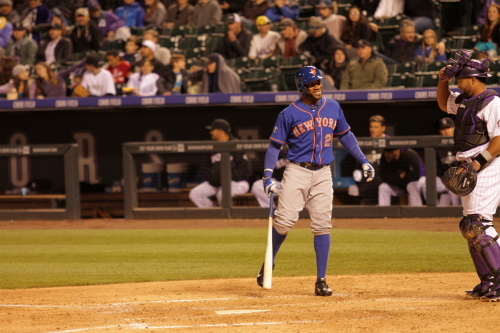 Eric Young Jr. pinch hit in the 6th for the Mets this is the first time I have seen him play for the Mets. Last year when the Mets came for the make up game I was in N.Y. and missed the game at Coors. Juan Nicasio did walk hime and here he is turning around at second on a Lagares fly ball to right field which was caught by Brandon Barnes who came into the game in the 5th for Cargo. Blackmon moved to center from right and Dickerson moved from center to left. 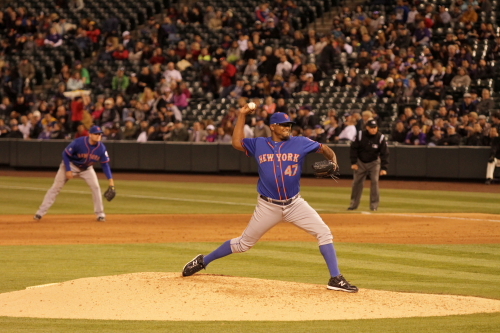 Jose Valverde pitched the 8th inning for the Mets. You know you have a good lead in the 8th when the relief pitcher is batting in his spot with 2 outs! He did strike out and came back out to pitch the 9th. 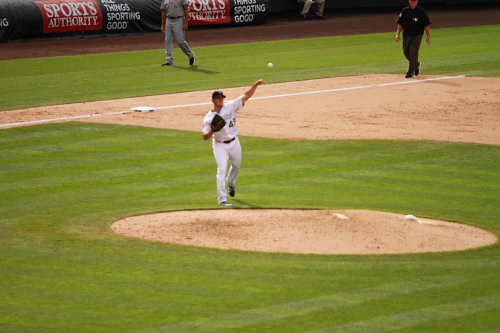 After another inning of 2 quick outs Chad Bettis gave up a single to Chris Young and then another to Curtis Granderson. Travis d’Arnaud then hit a 3 run home run the Rockies still had a 7-4 lead. 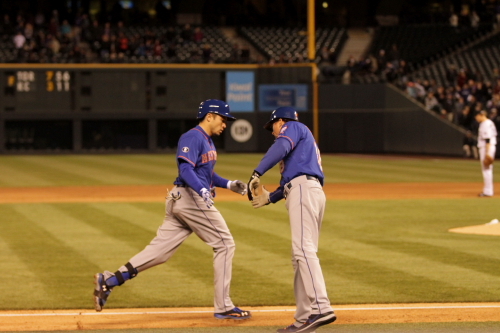 d’Arnaud passing Mets 3rd base coach Tim Teuful after his 9th inning 3 run home run. 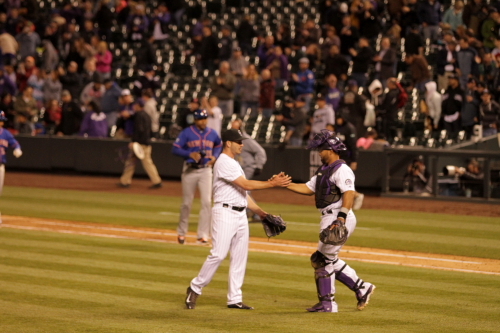 Ruben Tejada flew out to Barnes in right to end the game with the Rockies winning with the 7-4 score. This was a great game by Nicasio and was awesome to sit behind the Mets dugout. Thanks again Geoff. After the game I headed to the players entrance and got to say hey to The Mets broadcaster Keith Hernandez and got Tim Teuful to sign a card for me. He was a really nice guy and it was cool meeting another player that played on the 1986 World series team for the Mets. 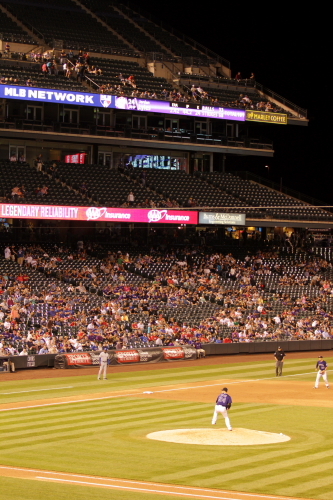 I will be at Coors for the remainder of the series and home stand see you at Coors! 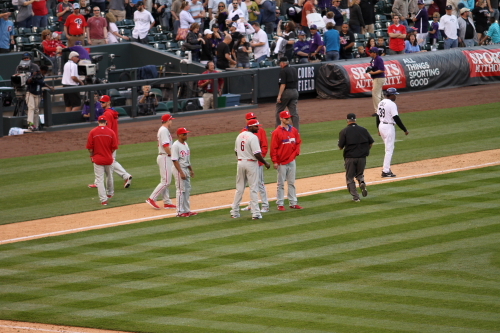 Rockies put up a Phight against the Phillies! Game 3 of Series my 9th of the year at Coors 10th with the Springs. Today being a Autograph Sunday we got autographs the 4 signers were D.J. 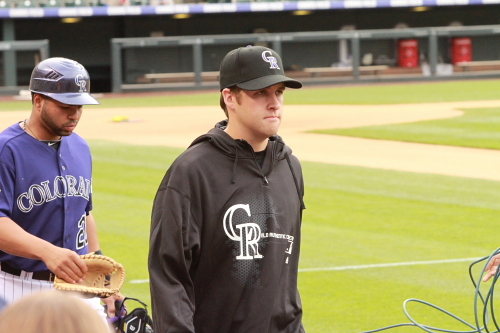 LeMahieu, Rex Brothers, Tommy Kahnle and Drew Stubbs. I had all 4 on my team project already so I only had a 8×10 of Drew Stubbs to be signed. I then had Carlos and his wife help me get a Ryne Sandberg auto after seeing him outside the stadium and him not signing Friday night and not getting him Saturday when he did sign after the game. I asked if they could bring a ball down behind home plate because they had tickets that allowed them to go down on the field behind home plate. They were able to get it for me and that was awesome of them! Thanks Again! The Ryne Sandberg signed baseball! Before the game at the wall I also got Brandon Barnes and Josh Rutledge on my team project which only leaves me with 5 Players I need on it and 2 coaches. I also got the Opening Day photo of Charlie Blackmon after hitting his homerun photo signed and he signed it 6/6 O.D. 2014. The Photo is in this link of Opening Day! Thanks Tanya for the assist on the Rutty ! After the autograph it was time for the game! 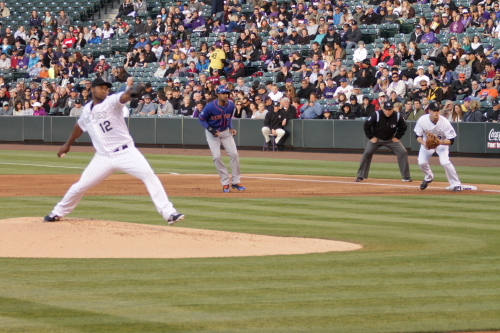 Juan Nicasio started for the Rockies today. This was his 4th start of the year. He has been pitching well this season and has 2 wins and no loses. He started the game with a ground out by Ben Revere to Nolan Arenado at third. The second batter Jimmy Rollins got the Phillies on the board fast with a solo home run. Nicasio kept it together well and went on to strike out Chase Utley and Marlon Byrd. He did give up a single between the 2 strike outs to Ryan Howard. Roberto Hernandez started for the Phillies. 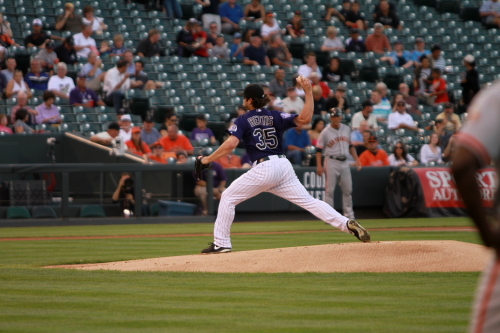 Charlie Blackmon struck out to start the inning. 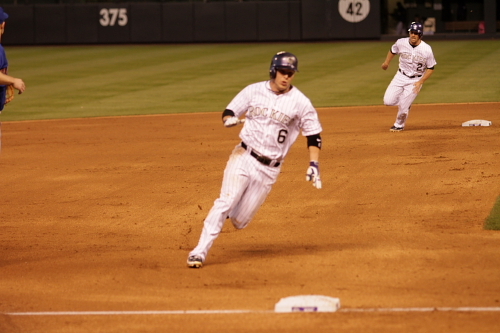 Brandon Barnes followed with a single he would later score on a Justin Morneau single to tie the game at 1. 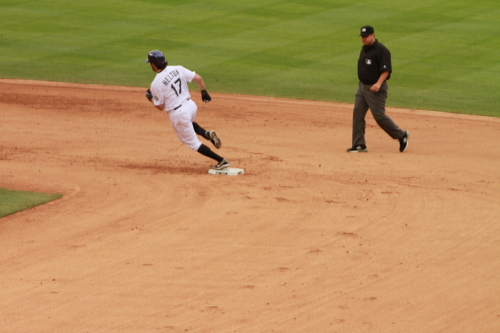 Brandon Barnes dives back to first. The Phillies would score 2 more in the 3rd Ryan Howard hit a home run scoring himself and Utley to give the Phillies a 3-0 lead. 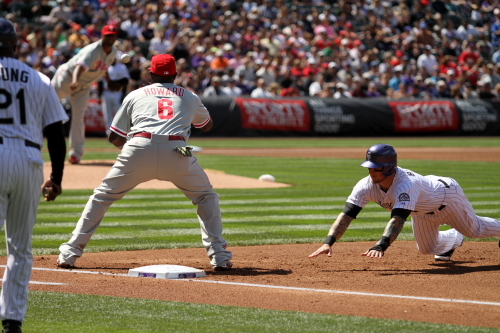 The Rockies did fight back in the bottom of the inning and scored 3 of there own. Charlie Blackmon lead off the inning by being hit by a pitch. 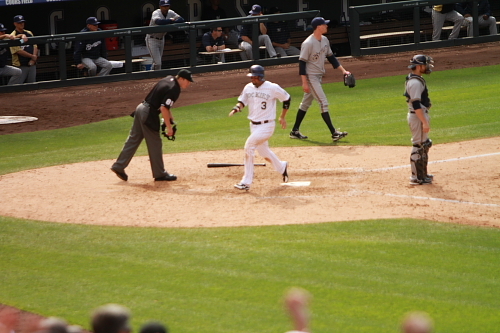 Brandon Barnes got on base with his second single of the game, but would be out at second on a Carlos Gonzalez hit. 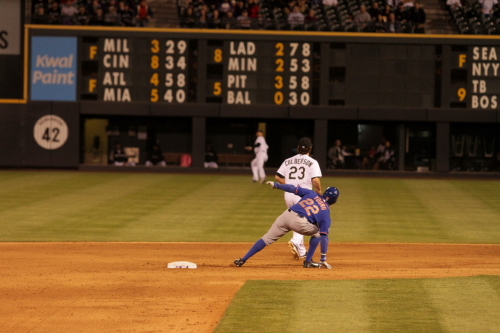 Barnes did a very good job of breaking up the play at second and prevented the double play. 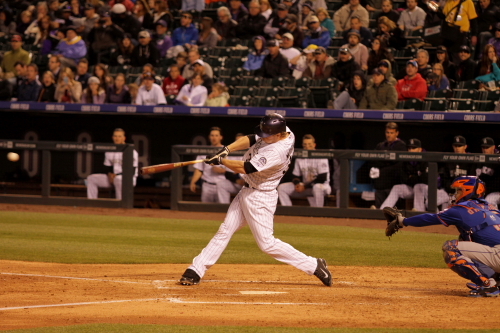 Troy Tulowitzki had a very timely hit with a double scoring Blackmon. 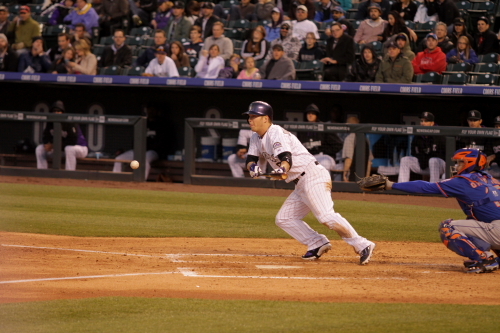 The Rockies then tied the game with a Morneau ground out to first scoring Cargo from third. 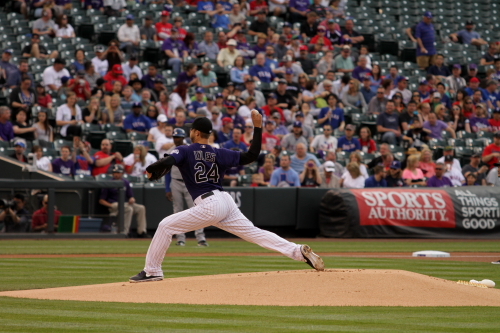 A Nolan Arenado single scored Tulo and the Rockies had a 4-3 lead. 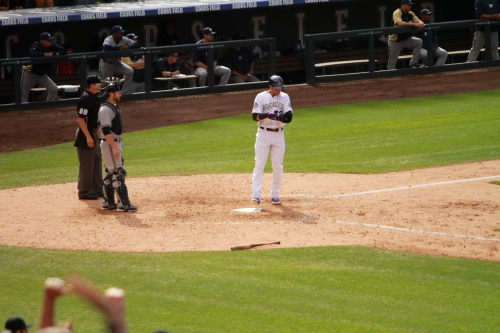 Arenado did get caught between first and second during Josh Rutledge’s at bat and ended the inning. The play was a 1,3,6,1,4,2,5. Just incase you were wondering how it was scored! Nicasio got all 3 batters out in the 4th. Josh Rutledge then Lead off the 4th inning since Arenado made the last out in the 3rd. Rutledge standing up after sliding into second. He did remain on base and did not score in the inning. 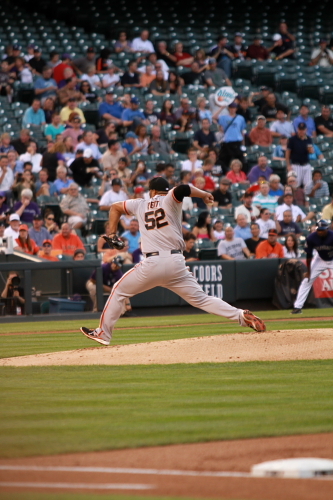 Nicasio had another good inning in the 5th. He did walk Jimmy Rollins but struck out Utley for the second time in the game to end the inning. During Pacheco’s at bat in the 4th he tipped a ball offs Wil Nieves foot. 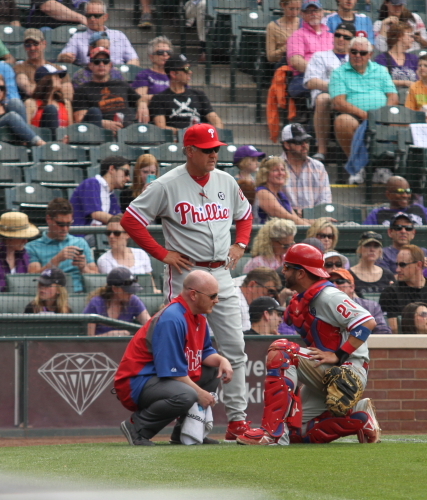 Here is the Phillies trainer and Manager Ryne Sandberg checking him out. He did stay in the game. 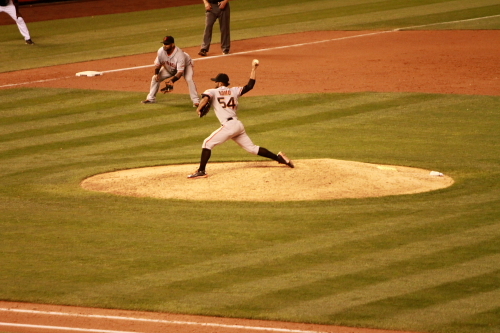 Blackmon takes a pitch for a ball during his 4th inning at bat. The Rockies scored 2 in the 5th to give them a 6-3 lead. Brandon Barnes scored on a Cargo double. 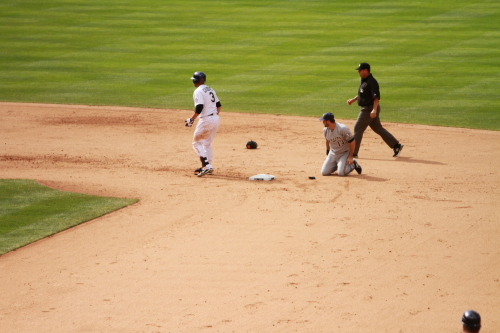 Jimmy Rollins dive back to first after his walk in the 5th. 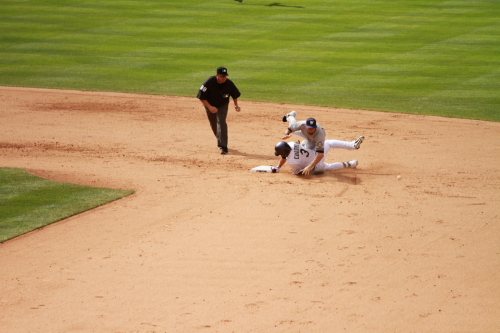 Ryan Howard leads off the 6th with a triple here he is sliding into third. It was not exactly the prettiest slide I have ever seen! 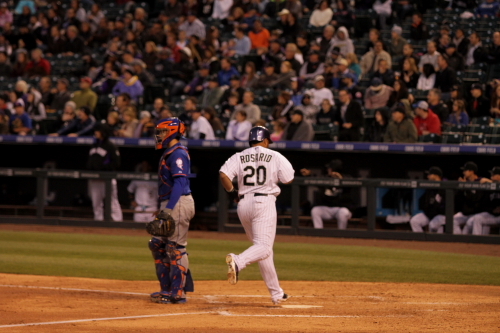 After Marlon Byrd hit a single after the Howard triple Juan Nicasio was removed from the game. Howard did score on the Byrd single. 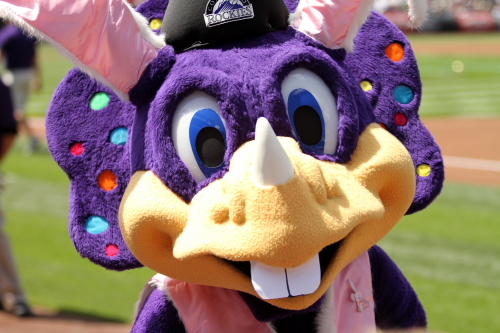 (6-4) RoxByrd scored on a Freddie Galvis single and the Rox still had a 6-5 lead. Rex Brothers came in after Nicasio in the 6th. Pacheco also started the bottom of the 6th inning with a triple, but was caught between third and home on a Corey Dickerson single and then Corey was called out after a review at second because his foot came off the bag at second. 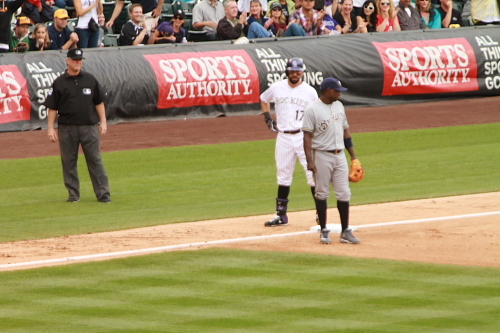 Cargo was removed from the game in the 6th after running out pop fly to end the 6th inning for the Rockies. 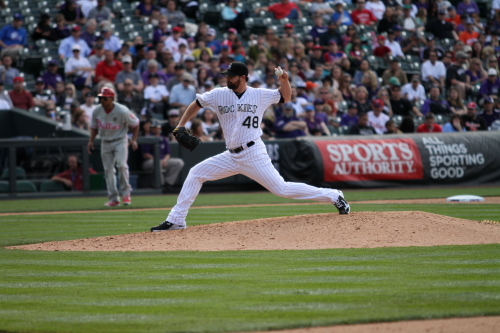 Boone Logan started the 7th for the Rockies. 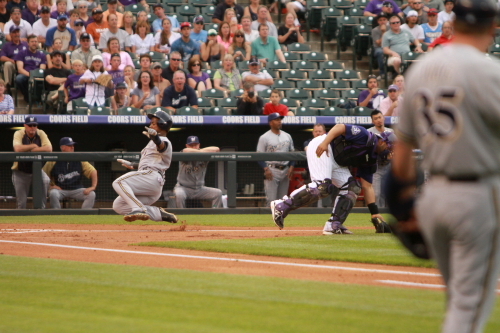 Charley Blackmon tried to get things going for the Rockies again with a solo home run to make the score 10-9. 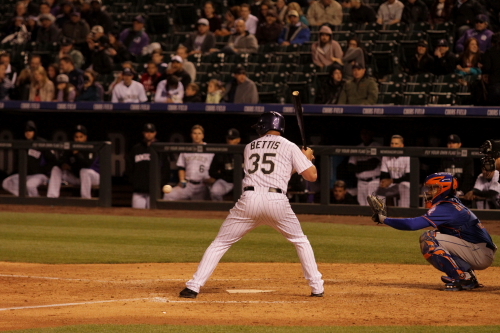 Drew Stubbs hit a double but was left on base with Tulo who walked in the inning. Tulo did reach base 5 times this game went 3 for 3 and walked 2 times. He also hit a double in the 7th. He was on base for the Morneau homer. 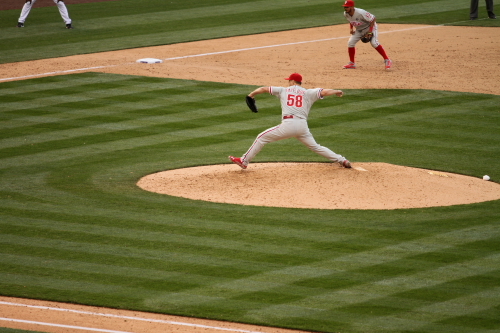 Jonathan Papelbon pitched the 9th for the Phillies. 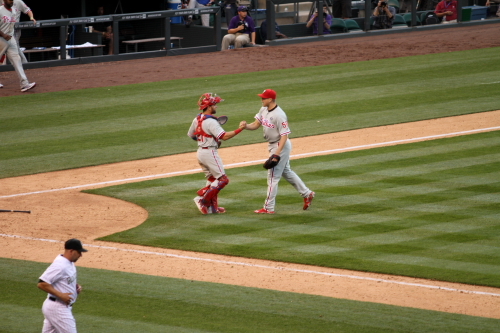 Here he is shaking hands with Wil Nieves after Blackmon made the last out of the game or was it!!! The umps reviewed this one and it did stay as it was called on the field and the game was over and the Phillies won 10-9. The Rockies did take the series 2-1. This game was a real rollercoaster of great offence and bad running O.K. by Nicasio which kept the Rockies in the game and then the bullpen falling apart. And the bats trying to take back the lead and then falling short this was an exciting game with not the out come we would like but the Rockies did fight to keep them close. Another note is that Ryan Howard almost hit for the cycle he hit a single in the first, Homer in the 3rd, triple in the 6th and did end up on 2nd in the 7thbut it was ruledo a single and an error on Barnes in right advanced him to second. Rollins was also a triple awy from one also. The Rockies are back at .500 with a 10-10 record and are 3rd in the west 2.5 games behind the Dodgers who are in first and 1 behind the Giants. So that is it for this one the Giants will be in town for 3 the next 3 days. Who needs a title this home stand took a while! My 50th Game at Coors this Year. 63rd including Road Trip and The Springs. I believe this is the correct #’s seems like I always miss a game somewhere when counting think I totally got it! 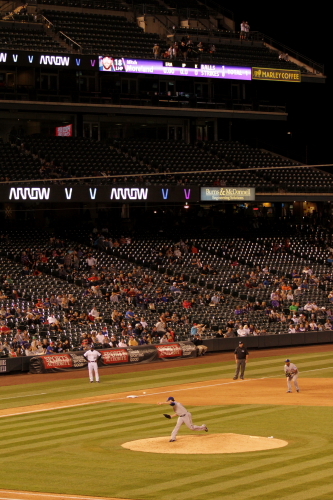 Another fun Sunday at Coors said slightly sarcastically by the blogger who hates amateur days at the stadium. As usual it was a bobble head day and also autograph Sunday which the combination of the 2 is just horrible which I have mentioned before. I will repeat what I have said before about having to get to Coors at the same time on bobble head Sundays with a 2 PM game as we use to for the 1 PM games last year, because of parking and the demand for bobble heads. thrown in the mix is the usual autograph Sunday which become a cluster because the signs and lines are not set up when gates are opened or who the signers may be. Today it was announced that the signers were Charlie Blackmon, Adam Ottavino, Rex Brothers and TBA. So when we got in the signs were not posted for the line for who is where. So I got into the 4th line hoping that the TBA would be there and someone I would need. So for the 40 minutes that we had to wait in line the TBA was announced and it was to be Wilin Rosario he was going to be in the first line which was already very long Rex Brothers was the second line, Adam Ottavino would third and Charlie Blackmon would be the 4th. So I did not have anything for Charlie, but stayed in his line anyway and had him sign a 8X10 of the same photo that I have the 16×20 of that I am using for my team project. I was unable to get anyone else so I just waited around. In another twist the first lined ended up being D.J. LeMahieu. Thankfully that was the last Sunday with a Bobble head and it will return to normal autograph Sunday set up for the remaining Sundays. Not to forget the bobble head today was Ellis Burks. 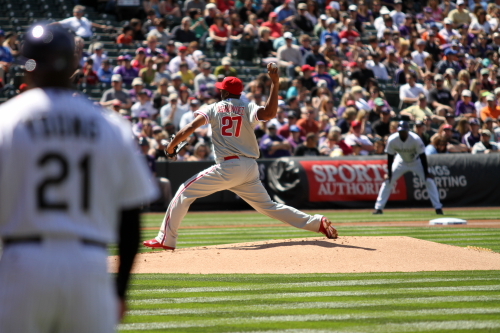 Jhoulys Chacin was the starting pitcher for the Rockies he immediately got to work striking out Rickie Weeks. 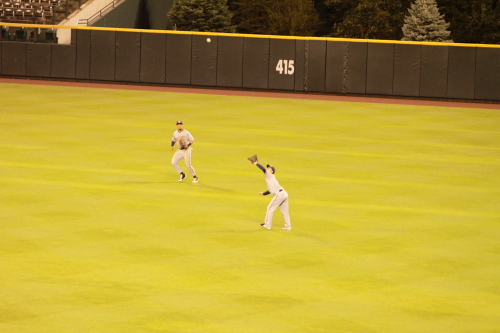 Norichika Aoki grounded out and Jonathan Lucroy flew out to left field. he got the inning over quick and with just 11 pitches. 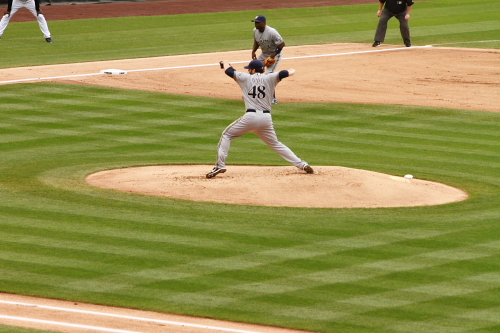 Donovan Hand started for the Brewers. 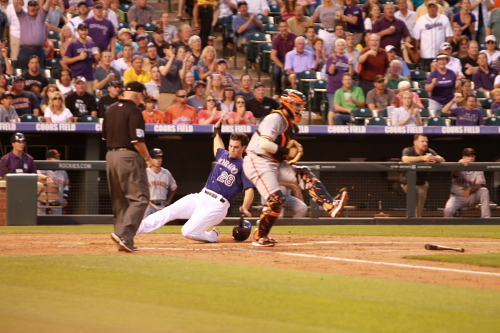 After getting Dexter Fowler and Corey Dickerson out Troy Tulowitzki hit a solo shot to get the Rockies on the board. now this is a good time to hit a solo home run, early in a game to get your team on the board! 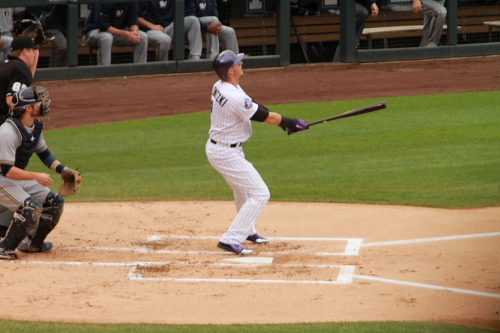 Tulo watches as the ball heads to left field. (1-0) Rockies. The Brewers than proceeded to score a run in the 2nd third and 4th. (3-1) Brewers. 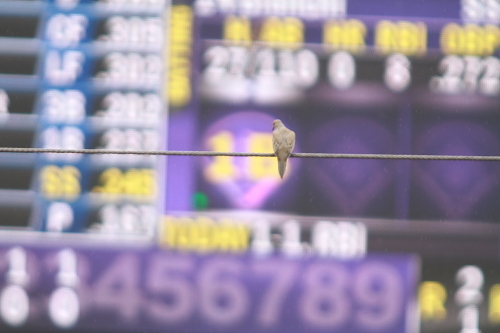 This guy had a pretty good seat for the game! 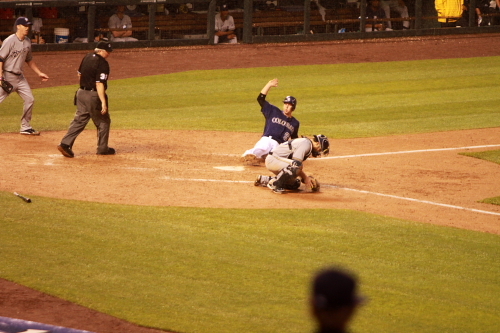 Yes you see this correctly that is Todd Helton making the turn at second for a triple in the 4th inning! Todd at third base. This was his first this year and only the third in the last 5 years, he did also have 1 last year! In his career he has a total of 37 and had 3 seasons with 5 that being a career high for a season. The 5 Triples came in 1999, 2003 and 2006. 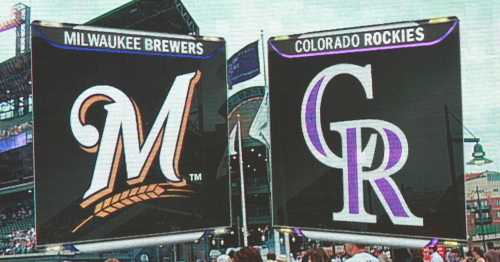 The Rockies or the Brewers scored again till the 6th inning. The Rockies picked up 2 runs in the 6th. Corey Dickerson hit his first MLB home run to lead off the inning and 2 batters later Michael Cuddyer hit a solo shot to tie the game at 3. 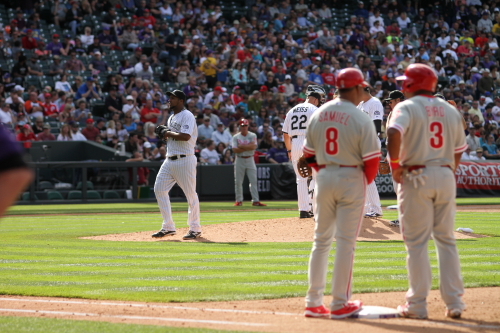 The Rockies would regain the lead on a third solo home run in the 7th inning. That one was hit by Dexter Fowler and gave the Rockies a 4-3 lead. In the Brewers half of the 8th the brewers would once again get the lead with 2 runs in the inning. 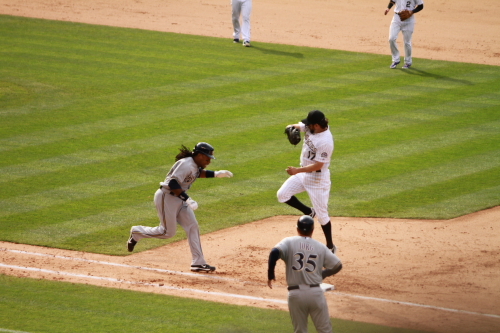 Yuniesky Betancourt hit a home run with Carlos Gomez on third, he reached third after hitting a double and stealing the base the Brewers now had a 5-4 lead. 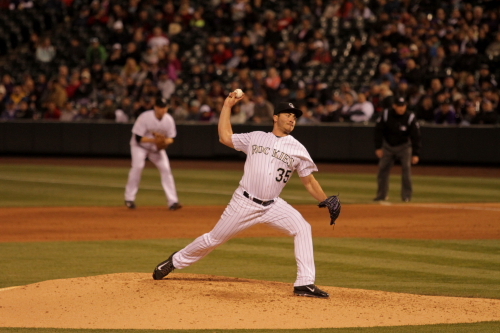 Matt Belilse came into pitch for the Rockies in the 8th inning. Chacin pitched 7 giving up the 3 runs in the 2nd, 3rd and 4th. He gave up 8 hits walked 1 and struck out 4. 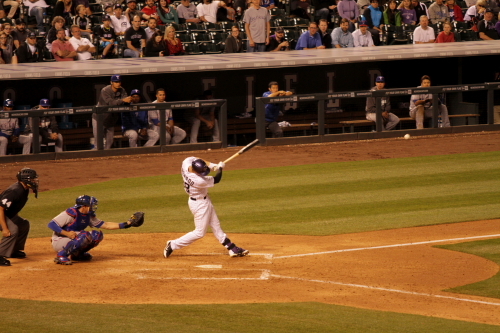 Cuddyer hitting a double in the 8th inning. Scoring Tulo who lead off the inning with a double to once again tie the game. 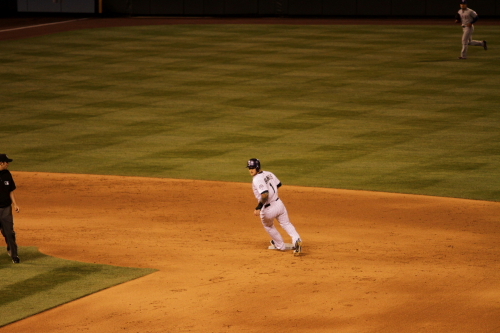 The Cuddy hustle down the first base line. 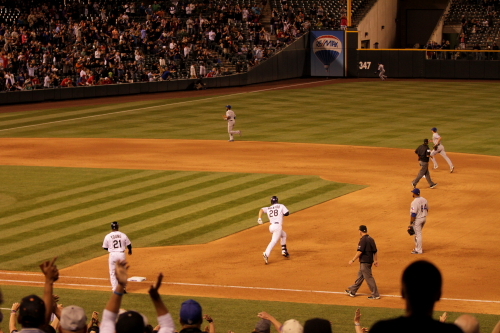 Tulo rounding third and heading for home. 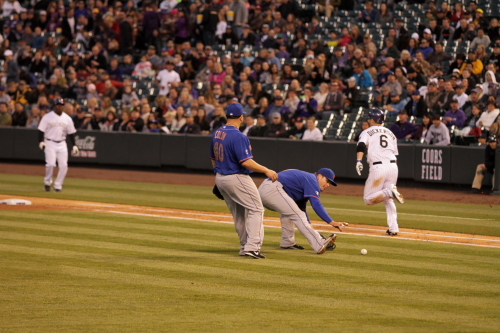 Cuddy taking out short stop Jeff Bianchi as the ball goes past second base. 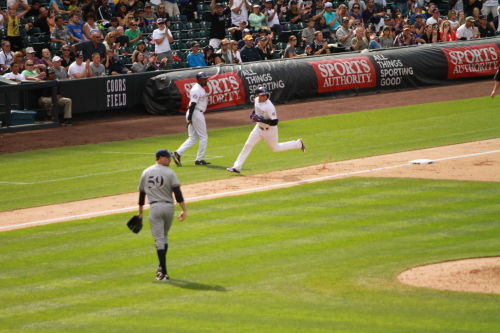 Tulo stepping on home to tie the game at 5. Bianchi gear looked like a garage sale,(Snowboard/Ski term for losing your Sh!t on a fall) yes that is his glove about 10 feet behind second. 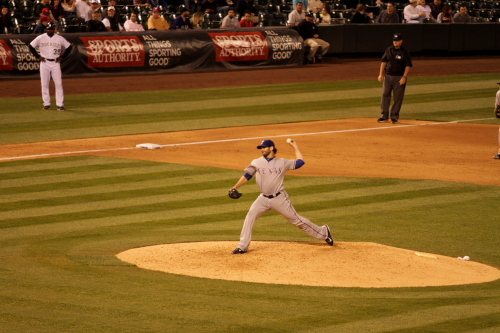 John Axford started the 8th inning for the brewers, here’s a hint he did not finish it! 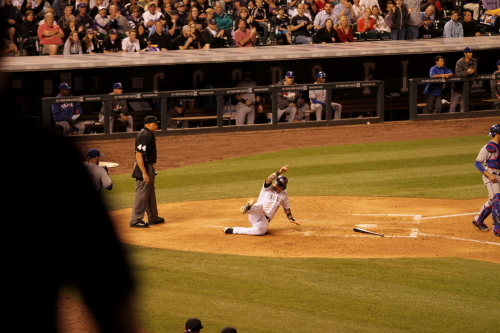 Here he is scoring after a Arenado single. This gave the Rockies a 6-5 lead. 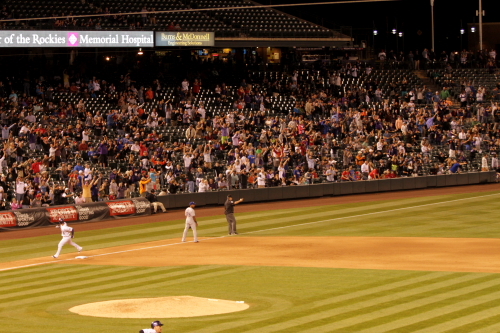 he lined out to Cuddy in right. 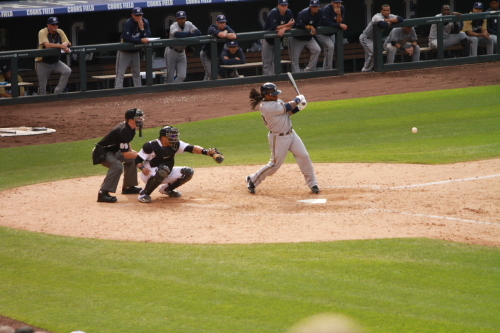 Rickie Weeks gets a piece of this Rex Brothers fast ball. The ball was hit back to Brothers and he made a throw to Helton at first. 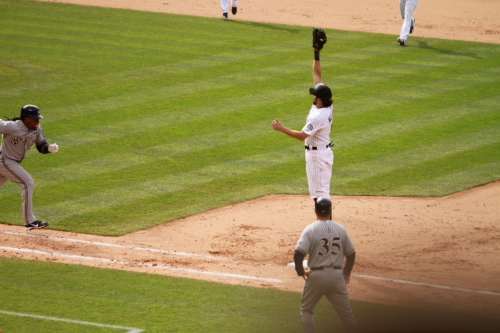 He threw the ball high and Helton made a great save pulling this one out of air. But did not land back on the base in time and Weeks got a single. I think when Helton landed he did not hit the bag. 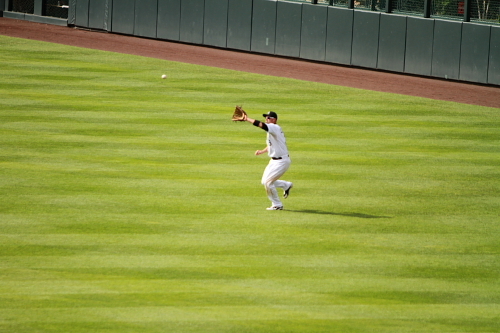 Aoki ended the game with a fly ball to Dexter Fowler. 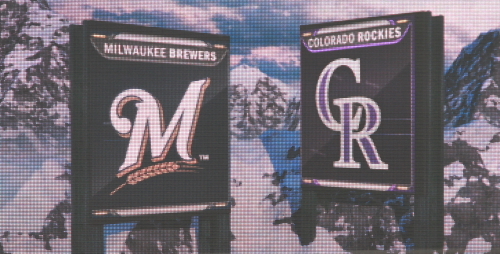 The Rockies would win this game 6-5 and the series 2-1 and go 5 and 5 this home stand. They really needed wins this home stand. Playing against the Cubs, Miami and the Brewers. The should have won at least to or even 3 more games against these teams. They are 3 of the 4 worst teams in the National League. Well that is it for this one, It was a win before they hit the road. I finally caught up and they return from the road trip against the Pirates on Friday. Thought I was gonna get some games in at the Spring and Grand Junction this week, but looks like it is not happening. Guess I got to get some hiking and me time in before they return home! So today I tried something a little different instead of rushing to the stadium to be there for 4 O’clock when the gates opened I left my house about 4:10 and got into the stadium about 4:45. I missed the Rockies BP and the Brewers were hitting when I got into Coors. With in about 10 minutes of being there I got a BP baseball. Not bad for slacking and showing up 45 minutes late! Not that this will start a new trend of showing up late, it just shows sometimes I don’t have to put in as much time to get a ball. 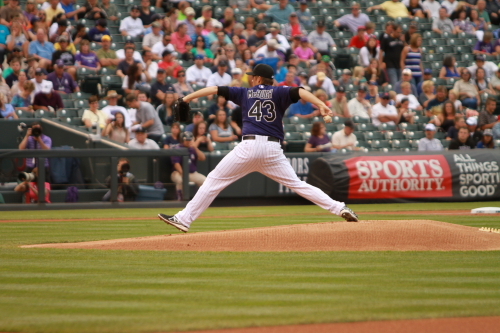 Today was the Rockies debut of Colin McHugh he was the pitcher we had gotten from the Mets for Eric Young Jr. McHugh has been in the majors before with not much success, His best game was last Aug. in his MLB debut against the Rockies at Citifield in NY. 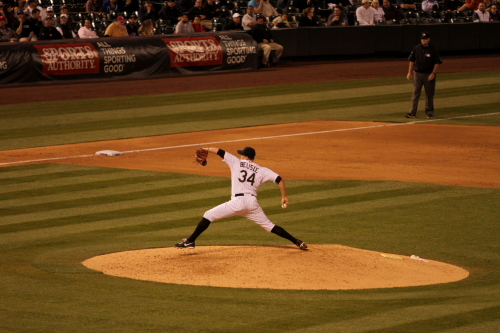 He has been pitching well in Triple A Las Vegas this year with a 3-2 record. After being traded the Rockies optioned him to Double A Tulsa. He was brought up to see if he could fill the Rockies available starting spot. 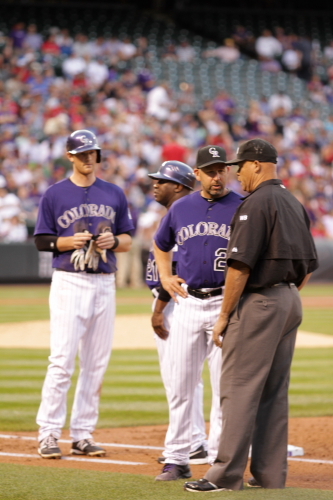 which has been kind of revolving door this season for the Rockies. 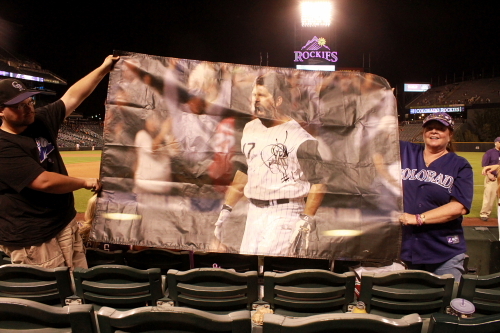 Before warm ups Todd Helton stopped and signed a few autographs. As usual when he signs it was a mob of people rushing over to where he was. I came close to getting one this time but did not. I do have a few cards for him to sign but nothing that is important to finishing team sets or anything. Here is Colin McHugh throwing his first pitch to Rickie Weeks. It was a fastball for a called strike. Not a bad start but that did not last long the second pitch was a ball and the third was a hit to left field resulting into a double and later a run. 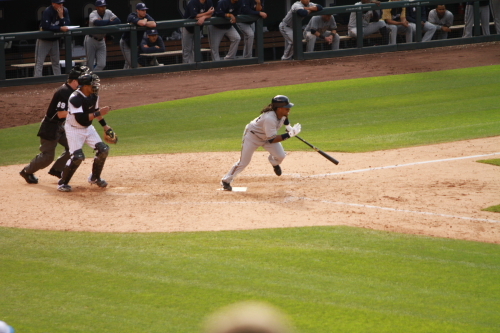 weeks advanced to third on a Norichika Aoki sac-bunt and scored on a Jean Segura single. 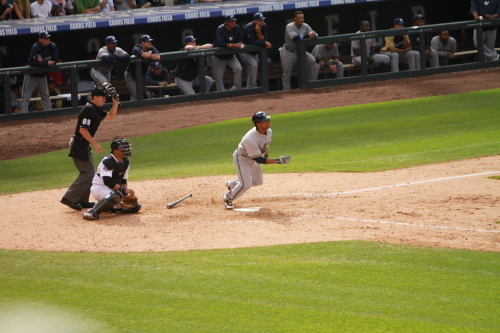 Jonathan Lucroy hit another double for the Brewers 2 batters later and that put Segura on 3rd., he would than score on a Carlos Gomez sac-fly to right. Lucroy scored on a Caleb Gindl double for a 3-0 Brewers lead. 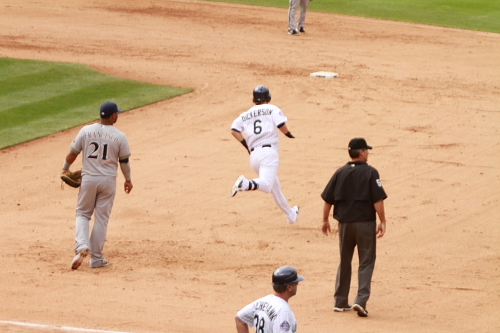 Segura diving back to first after his single. 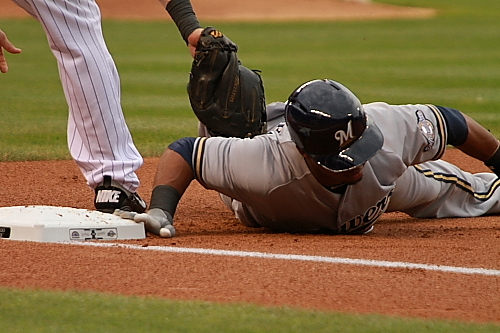 Here is Segura sliding at home for the Brewers second run. Jim Wright visiting the Mound in the first inning. 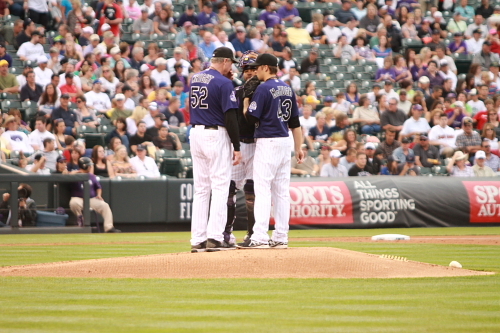 The Rockies hitter did not do much in the first against the Brewers starting pitcher Tom Gorzelanny. Dexter Fowler flew out to right to start the inning and then D.J. LeMahieu and Troy Tulowitzki both struck out. 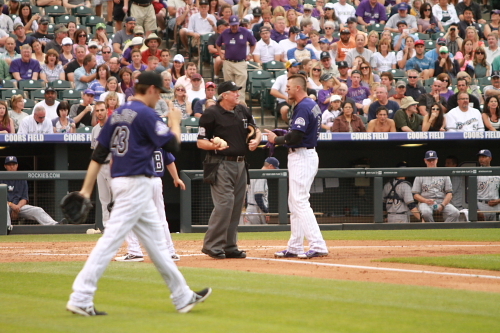 Tulo discussing the called strike with home plate umpire Dana Demuth. McHugh settled down a little in the 4th only facing 3 batters, he did get a slightly inside on Jean Segura who got hit by a pitch but did not get the base because it was during a swing for a strike. 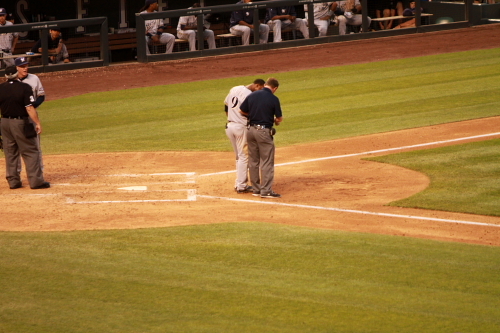 Segura being checked out by a member of the Brewers training staff after being hit in the inning. The Rockies tried to get the game back in the 6th. here is D.J. 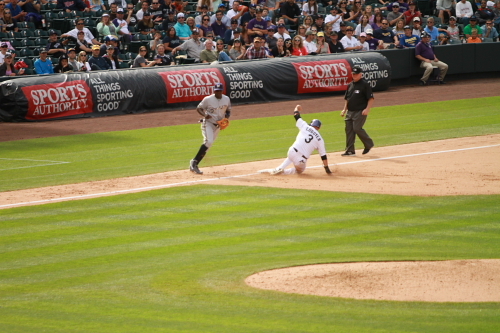 LeMahieu sliding into home for the first Rockies run of the game on a Tulo single. The Brewers would get a 7th run in the 7th. a solo home run by Lucroy off Adam Ottavino. Ottavino came in to pitch in the 6th inning. McHugh went 5 full innings giving up 6 runs on 9 hits walking 1 and striking out 2. Ottavino pitched the 6th and 7th the only hit he allowed was the home run to Lucroy. Corey Dickerson pinch hit for the pitcher in the 7th. He hit a single with one out. 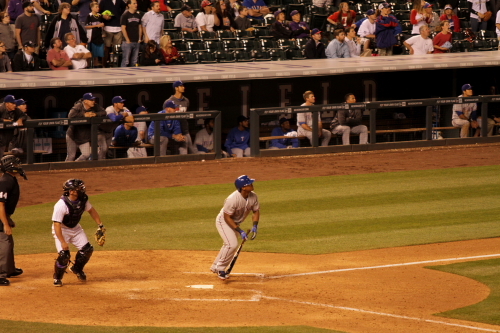 Dexter Fowler reached also in the 7th on an error by first baseman Francisco. He would get out after LeMahieu hit into a double play to end the inning. 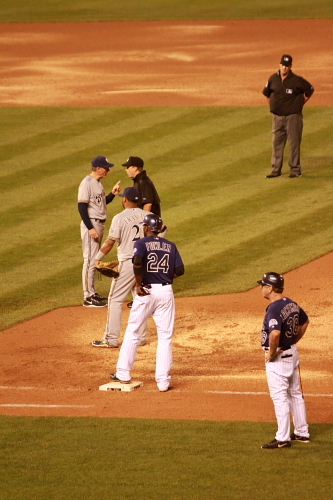 The Brewers manager did come out to argue the call with first base umpire Cory Blaser. The Rockies did get a run in the 8th. 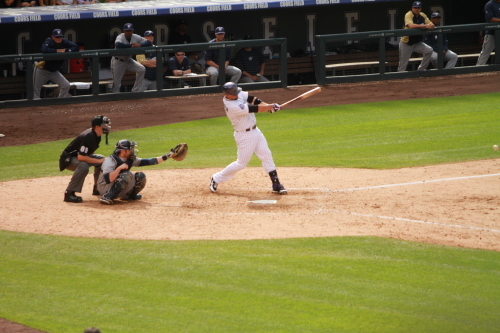 another one of those To Little to late solo home runs to lead off the inning by Tulo. Glad to see him hitting but where are these home runs with runners on when we are down by 3. 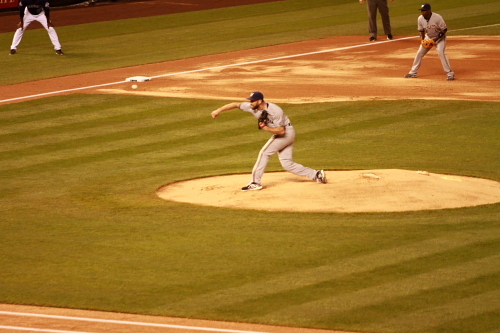 Jim Henderson pitching for the brewers in the 9th inning. he was the Brewers 4th pitcher of the night. Their starter Gorzelanny went 6 innings and was responsible for 4 of the Rockies runs. 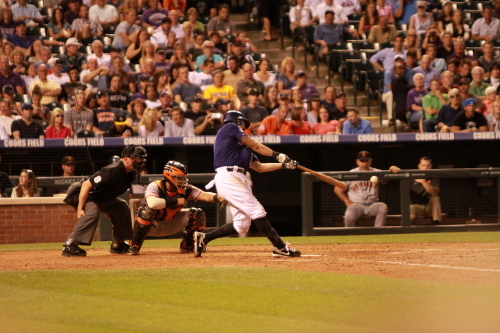 Henderson would strike out both Nolan Arenado and Charlie Blackmon. Jonny Herrera came into pinch hit for the pitchers spot but flew out to right to end the game. So the Rockies let this one get away with a bad pitching attempted by McHugh and lack of runs support even know they did score 5. The final was 7-5 and that was it for game to against the Brew Crew. Still playing catch up with the last home series. While I am writing this the Rockies are getting ready for game 2 against the Pirates in Pittsburgh. After the very bad series in Atlanta they did get the first game against the Pirates who have been real hot lately lets hope they can cool them down this week since they have to face them back at Coors next week. I would also like to thank everone who follows the Rox Addict blog once again I made the top 50 at #42 for the month of July. Till then I will see you at Coors. I am going to have the winner pick the prize there are a few autographs and some 20th anniversary items up for grabs.